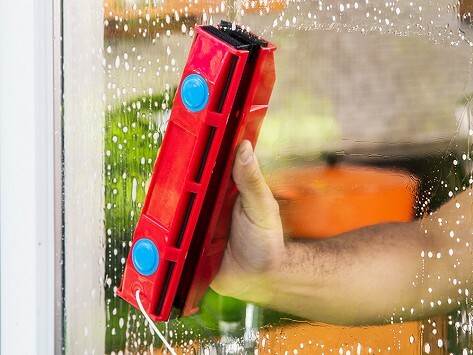 Clean the outside of windows with a magnetic cleaner that makes the job safer and easier to do—from the inside. The two part tool uses magnets to reach the outside of windows (with designs to suit different glass thicknesses) or you can use the tool to clean both sides at once. A squeegee and microfiber cloth get things sparkly clean and a safety cord ensures the outside part of the cleaner stays with you in case of a fumble. Dimensions: 2" x 9.6" x 4"
It takes awhile to get the hang of it but it does work! The string is a must..!! Great innovative way to clean windows! I live on the 5th floor. Up till now, I thought that in order to clean my windows properly I'd have to have someone climb down from the roof, or something like that. These magnetic wipers change the game! I learned a little too well that these magnets are very strong when I accidentally put them too close to each other (don't do that!). I also checked that the string works well in making sure that the outside wiper doesn't fall (I didn't put enough soapy water) and that it's not too heavy on my finger either. Bought the extra strong model, the magnets are very strong, clean well my hard-to-reach thick windows. A safety string keeps the outdoor part of Glider connected to you in case of a fumble, which we really appreciated (and used) when we tried it out.